A group called X-men have a special proposal, for all those who have served the community through Serve the City Geneva. If you have a red STC T-shirt read on, as this is the price of admission. This group of X-traordinary men wants to honor those who have served the community. A Bar-B-Que and trimmings is their way of thanking STC volunteers for the hours of work they have done. Volunteers are the heart of our organization and they want to show us their appreciation. The event will take place in Ferney-Voltaire at ch. de la Brunette, in fellowship hall, Crossroads church building. Please sign up at the STC website. Voix Libres a center to support orphans and single moms in Bolivia have a container arriving and they could use some help moving a container load of quinoa and hand made goods into their store just behind the train station. Because we are not sure of the date, signups are only to be able to notify those who are interested, if the date then works for you. Other options mentioned on our webpage are also available thru Voix Libres. 24 Nov. the true Samedi du Partage currently offering 4 stores..any one of 3 shifts, 8-12,12-3, & 3-6pm. This Saturday we are still a few hands short for setup and serving 1000 people at the TheMeal at PlainPalais. Do signup for the event, your help will be welcome. It’s that time of the year again when we honor the local farmers and consider the environment.! The Meal – Un Repas Pour Notre Avenir will take place on September 22 at Plainpalais grounds. The event would be supported by Serve the City Geneva with at least 30 volunteers, who will help with the setting of the area with Tables and benches, serving the food, helping with the clear up at the end of the day. The day starts at 7:30 am and will go on until 5:00 pm. Volunteers can stay throughout the day or choose specific tasks or time frames.. So, volunteers come along and help support this wonderful event. We could use some more French speakers for the event as well. Looking forward to early sign ups on Serve the City Geneva website. We have a couple more spots open for servers from 9 to 1 to serve those in need. The idea of the «Fifth Day» is brought by chef Walter el Nagar, distinguished by the Gault & Millau 2017. With other talented chefs from around the world, he founded the Société anonyme cuisiniers, a collective that prides itself on a real social and culinary bias. The members of the collective are far from painting cooks as artists or geniuses of sort, but instead they encourage their members to be creative, avant-garde, radical and provocative, aiming to stimulate the critical minds and senses of their guests, making them an integral part of their work. They believe that the classic restaurant model needs to be updated. Open four days to the public, the restaurant proposes a bistronomic, local, healthy and organic food offer, from a perspective of sustainability. On the fifth day, the same menu will be served to less fortunate people sent by partner associations. For free! L’idée du « Cinquième jour » est portée par le chef Walter el Nagar, distingué par le Gault & Millau 2017. Avec d’autres chefs talentueux du monde entier, il a fondé en 2017 la Société anonyme cuisiniers, un collectif qui se targue d’un vrai parti-pris social et culinaire. Artisans modernes, plutôt qu’« artistes de génies », les membres du collectif cherchent à bousculer les certitudes et à faire réagir leurs hôtes par leur créativité. Ces cuisiniers anonymes sont déterminés à modifier la perception de la cuisine gastronomique, ainsi qu’à révolutionner le modèle actuel, mais dépassé, de la restauration et de l’hospitalité. Ouvert quatre jours au public, le restaurant propose une cuisine bistronomique, local, saine et à base de produits issus de l’agriculture durable. Le cinquième jour, le même menu sera servi à des convives en situation précaire, pris en charge par une organisation sociale partenaire. Et cela gratuitement ! Nos besoins : tous les samedis à partir du 22/09 inclus, nous avons besoin d’au moins 3 bénévoles afin d’assister le chef en cuisine (cuisine, service, nettoyage), de 11h à 15h. Grâce à votre engagement, vous contribuerez à ce projet social qui offre l’opportunité à des personnes marginalisées, sans-abri ou réfugiées de s’évader de leur quotidien le temps d’un repas et d’avoir accès à une cuisine exceptionnelle. Shop: during the week and on Saturday (flexible hours)- they said that they need more a woman who likes to sell and understands the importance of their work and the impact of each article sold on the women’s life who became entrepreneurs in Bolivia (after they went through slavery in the mines or victims of domestic violence). could use 3-4 more helpers.. The zoo is looking for 4 to 8 volunteers (or more groups of 3 to 4 during the week) to help out with various maintenance projects. We have a special need for a carpenter type if you have that gift. Wednesday 18 July: FULL Ronald McDonald House garden party no more spots. many thanks for support..
start at 10am on the Sunday , Clearing basement for painting..
Read on for information about our Partage activities in June and July and about a number of upcoming volunteering opportunities that we hope you can be part of. Thank you all again for signing up to help with the sorting of all the donations collected during the Samedi du Partage. This year, nearly 150 tonnes of food and toiletries were donated. In spite of the collection being so large, the many volunteer teams, including those from STCG, have done such a great job of sorting that it’s been completed in record time! In fact, there’s not enough work left to fill the rest of STCG’s Partage sorting dates so we have had to cancel some unfortunately. The following dates are still going ahead: Wednesday 4 and Friday 6 July. Sorting will then be finished! Sorry to those whose sorting dates have been cancelled – look out for the next chance to take part after the November collection! More than 1000 people benefit from the Partage programme every day. We are truly glad to be a part of it and we thank all the volunteers who have contribute to the collection and sorting. Every year on 18 July – Nelson Mandela’s birthday – people all over the world are encouraged to give some of their time to voluntary activities in memory of his decades of service to humanity. We at STCG have put together a number of events in July, details of which are given below. Of course, you can also participate your own way by helping out your neighbours or members of your community – let us know by email or on Facebook how you took part! 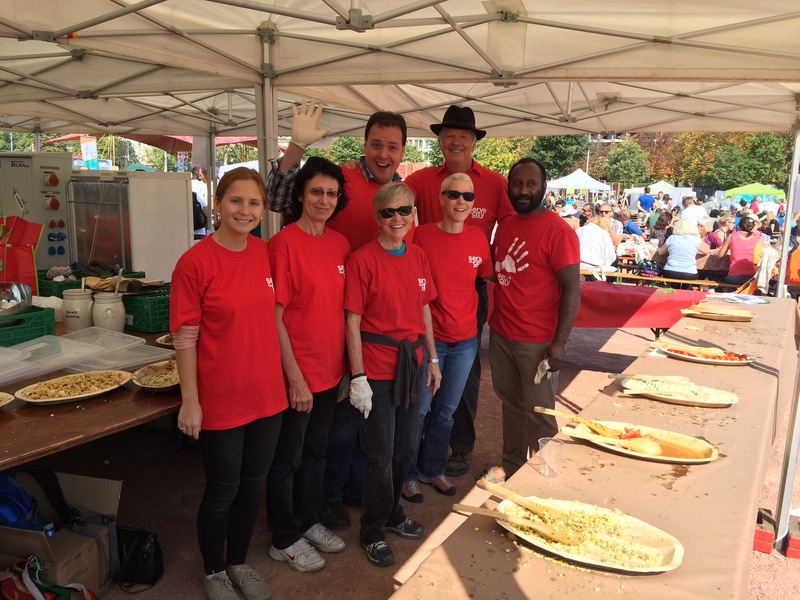 From 10 July, we are looking to recruit an additional 3 or 4 volunteers to back up our existing team during the summer to ensure that STC can continue to feed up to 200 hungry and needy people in Geneva every Tuesday. Sign up on the Current Activities page if you’re interested! The zoo needs some redecorating – we will be replenishing the insides of the enclosures with fresh branches, leaves and special treats for the animal guests. If you’d like to help, sign up on the Current Activities page. This large animal park concentrates of taking in and treating wild animals in difficulty, safeguarding and reintroducing threatened species, supporting environmental education and promoting Swiss wildlife. The zoo is looking for 4 to 8 volunteers (or more groups of 3 to 4 during the week) to help out with various maintenance projects. Join us and conservation charity A Rocha as we mark International Nelson Mandela Day of Service with a rewarding outdoor activity. We will be clearing invasive plants from the nature reserve in Laconnex (see location here) in order to promote the growth of indigenous flora and fauna. The meeting time is at 10am and we will finish sometime in the afternoon, depending on progress and motivation. Our work with A Rocha has always been appreciated by volunteers, and it’s a great way to serve while enjoying the great outdoors! Sign up on the Current Activities page, and, since the nature reserve is not easily accessible by public transport, please let us know in the comments if you are driving and could pick up other volunteers (and where from) or if you don’t have transport and would like a lift. We are looking for 3 to 4 volunteers to lend a hand at the garden party of the two Ronald McDonald Houses near the HUG. These houses are used free of charge by parents of children undergoing treatment at the hospital, allowing them to be nearby. Sign up online! This is another wonderful opportunity to help those who help others: La Maison de Tara (79 Ch. de la Montagne, 1224 Chêne-Bougeries) is a small hospice that provides home-from-home care for people nearing the end of their life when staying at home is not possible but they don’t wish to be in hospital. This charity exists thanks to the support of its kind and generous donors, the unending support of the commune of Chêne-Bougeries and the support of over 100 trained volunteers. The charity needs a few extra volunteers to help clear the basement so that it can be painted. This will involve emptying cupboards, wardrobes, drawers and storage boxes and then moving the empty items to another part of the basement while the painting is carried out over 3 to 4 days. The clearing job will start at 10am on the Sunday and is expected to take around 3 hours, but may continue into the afternoon. If you’d like to help, sign up here. Once the painting is complete, more volunteers will be needed to help put everything back – date to be confirmed. STC is always looking for project managers, and right now we are especially keen to find someone who might have or find contacts in the Red Cross to see how STC might be of help to them. Thanks for your continued service and we hope to see you at some of our upcoming activities!